Due to weather and tech issues this event has been cancelled and will be resheduled. Thanks! This is going to be fun! 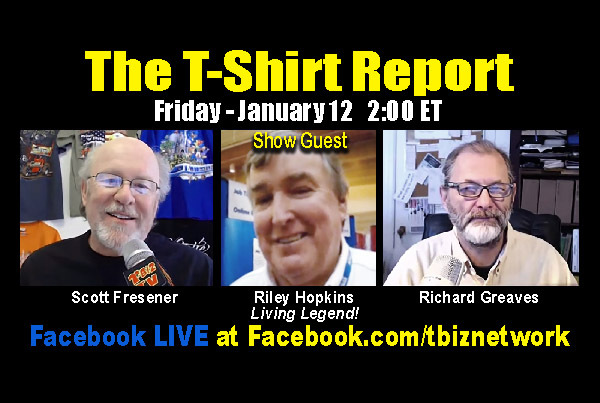 The Fresener-Greaves T-Shirt Report is having their good friend, Riley Hopkins as a guest on the show January 12 at 2:00 pm ET. This will broadcast on Facebook LIVE at the T-Biz Network Facebook page. www.Facebook.com/tbiznetwork. You can watch live or catch the replay after. BUT…. if you watch live you can ask questions and comment during the broadcast. Previous articleWhere are the customers? Next articleDeep Freeze Flash Sale on T-Seps and Courses.